Diatoms are among the most common types of phytoplankton, and originated more than 200 million years ago. They are commonly monitored when studying water quality, both past and present, because of their sensitivity to a variety of ecological conditions. The FlowCam is aptly suited for microfossil research; it can rapidly count and classify microfossils in a liquid sample. Images can be sorted by morphology and libraries can be created to semi-automate the classification process. To learn more about FlowCam and its image analysis software, download the FlowCam 8000 Brochure for Analyzing Aquatic Microorganisms. To learn more about how the FlowCam has been used for aquatic research, download our list of published FlowCam papers. 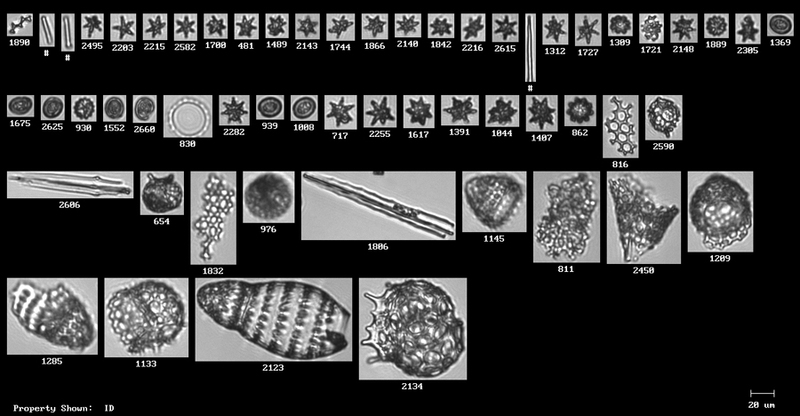 Microfossils analyzed by the FlowCam.